Household Organization Made Easy with Magnetic Picture Frames / Document Holders - Made in the USA of highest quality flexible vinyl materials. Any busy household could use a little help in getting (and staying!) organized. Our versatile vinyl magnetic picture holders are perfect tools for the job. There are so many uses for magnetic picture frames at home! It's so easy to unclutter your refrigerator door and instead have everything visible and neatly displayed. You can use them to frame your favorite pictures, your child's best school papers, documents and lists. From pocket sized to large, they are durable, can be written on and will keep documents clean and in plain sight for as long as you wish. Magnetic picture holders make fantastic gifts too - many people don't realize they're available, and they are absolutely thrilled to get a set for their own fridge door. Whether you need to protect and display pictures and children's artwork, magnetic picture holders help you organize your work schedules, notices and documents at the workplace too! Many a large and small company orders our heavy duty, flexible vinyl magnetic picture holders in volume and uses them as magnetic document holders because there are so many uses in office and warehouse settings. They are perfect tools to manage and organize their visual, lean, 5s workstations. Magnetic document holders cling securely to white boards, filing cabinets and shelving, the break room fridge door, lockers - in fact, any metal surface. Do you have a chore chart at home? Make a copy of it and stick it in a magnetic picture holder on the fridge – now nobody has an excuse for not knowing what they’re supposed to do! Children benefit from clear structure and routines and a magnetic picture holder can be used to display a homework chart, or the schedule for the week. Knowing what will happen and when is comforting and helps children take responsibility for themselves. Pop your shopping list into a magnetic picture holder in the kitchen and it will always be there in plain sight. Adding more items to the list is easy and you can simply begin a new list each week. 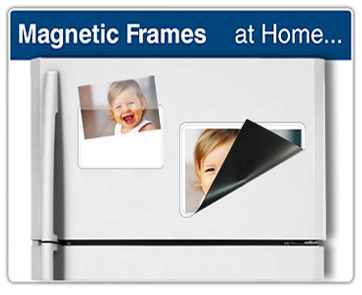 If, like most households, you’re trying to save some money, magnetic picture frames are a great storage solution for coupons and offers. Instead of hiding them away in a drawer and losing them, just pop them into the holder as you collect them. In an emergency, time matters. Create a list of important contact numbers and pop it into one of our vinyl document holders next to the phone. Include numbers for the doctor, dentist, vet, electrician, plumber and other people you might need in a crisis. Add numbers for family members and friends, and you have an instantly-ready reference for use when you need it most. Wherever in the home you might need a reminder, a sign or a list, our document holders will do the job neatly and efficiently. The beauty of these holders is in their ease of use and their versatility - what will you use yours for? 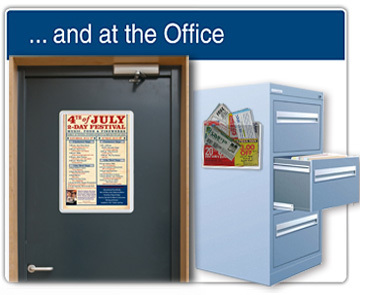 Magnetic picture holders can also be used as sign holders to display and protect a sign or keep a documents in constant view. They are handy to use as label holders in warehouses, since they are reusable and the insert is so easy to change. If you print your own designs on sheets of paper, slip them into sheet protectors. Did you know that even if you’re not actively paying attention to it, you absorb and retain a lot of information from things your brain sees every day? That’s why state magnets are such a clever way to help children learn about geography. Our set of 52 magnets comes with a free vinyl US map, which will fit any standard size fridge. Then comes the fun part - your children can attach the state magnets in the right places, or play games trying to replace the magnets after they’ve been mixed up. Who can fill in the map fastest? 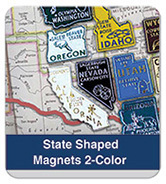 Each state magnet is two colored and shaped correctly for the state it represents. Highly tactile and visually appealing, each magnet carries the state’s name, its nickname, the name of its capital city and an image pertinent to the state - there is a lobster on the Maine magnet, for example and an elk on the Colorado one. This helps your child absorb information not only about the location of each state, but some of its key facts too. Learning is effortless with state magnets - every time your child or grandchild goes to the fridge, they will be reinforcing their knowledge of US geography. 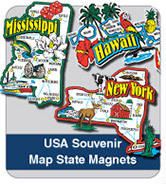 Individual state magnets are also a terrific way to inspire a love of travel, or to keep track of your US travels. Help kids find out where places they see on TV are, or where their family history lies. 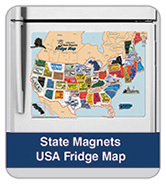 The full set of state magnets with the accompanying US fridge map is a wonderful gift for any parent with young children and it’s a conversation piece the whole family can get involved with. Choose one today and help the next generation learn the geography they need to understand their place in the world. 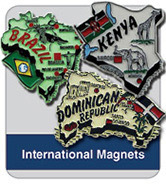 International Country Magnets and International Souvenir Magnets are very popular, both as souvenirs as well as learning aids for children. Help your children learn all the European countries with this printable blank map of Europe. on a USA map right on the fridge! By placing your USA Fridge Map where your kids can see it all the time, they'll naturally be drawn to it and start playing with the 2 color State Shaped Magnets - an instant, easy and fun USA geography lesson. Teach your kids in a FUN way about the United States. Having the map in constant view makes learning effortless! Great teaching tool for parents, teachers and home-schoolers. 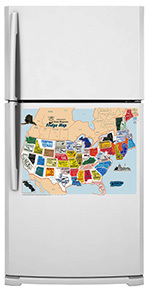 Our collector's USA Fridge Map fits the 2 Color State Shaped Magnets available on our site and offered in gift shops and truck stops across the US. Save a Life: What Could Be More Important? Magnetic Affirmations Holder: What a Way to Start Your Day!